Flashback to early May 2016 — a time of great pride. 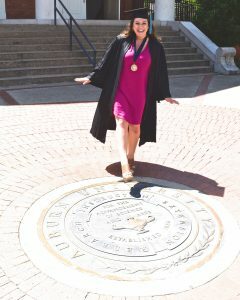 My daughter Sarah was graduating from Auburn. She’d be walking across that stage (on time, no less!) after a four-year college career that included everything she or any Auburn parent could hope for. It was also a time of melancholy. That four-year run flew by, creating a lifetime of memories for our entire family, not just for Sarah. It was exciting to be on the cusp of her new adventure, but it was also tough to say goodbye to the Loveliest Village on the Plains. Fortunately, we didn’t wallow in melancholy for long. We were blessed when— four days after that graduation ceremony— Sarah accepted a job at 2U (www.2U.com), a DC-based international education technology company that is routinely named one of D.C.’s best places to work. This June, she will celebrate her one-year anniversary. This outcome mostly resulted from how Sarah followed her passions as an undergrad, carefully weighed her options, then cranked up her networking and interviewing efforts as Graduation approached. As first-time parents of a college grad, my wife and I learned a lot as her sounding board and positive influencers during her journey. Sarah wasn’t shy about “adjusting” her major as her Auburn experience unfolded. As parents, we were supportive as long as her reasoning was sound. She began college as an early education major. That had been her driving interest all through high school, where she enjoyed internships with local elementary schools and earned a state teaching certificate for the hours spent with her pre-K kids. But then came the Beat Bama Food Drive (BBFD). She became involved with this as a freshman in Toomer Hall. At the same time, her education classes introduced her to an after-school reading program at a local Auburn elementary school. The kids there stole her heart, and their circumstances, along with what she was learning through BBFD, underscored the extent of food insecurity in the local community. Around this time Sarah seriously considered changing her major to help prepare her to be an advocate for those in need. Public relations and communications seemed like a natural fit for her engaging style. Sarah’s commitment to BBFD continued, and she was selected president her junior year, leading her to serve as BBFD’s first two-term president and bringing about another course correction. Sarah realized that while education was still important to her, nonprofit studies would align with her growing servant-leader inclinations. Fortunately, Auburn has an innovative Interdisciplinary Studies program that allowed her to craft a degree program across nonprofit studies, communications, and business. Somehow she also found the time to win a spot in the Aubie Family as a Director of Aubie and thus being part of Aubie’s 9th national mascot title. Her experience here would create relationships and connections that also paid off. As graduation neared, Sarah was faced with another big decision. Should she stay on campus and go directly into a postgrad degree or dive into the workforce? Through her work with SGA and Student Involvement, she experienced some great internships. One of these turned into an AU paid postgrad assistantship opportunity, with the huge benefit of free tuition for her master’s program. Music to her parents’ ears for sure, but we realized that was only part of the equation. She sought and received quality advice from the peers and mentors she trusted the most, who led her to consider to go out into the world and gain different experience. Then she’d have an even wider perspective (and different kind of value) to bring back to Auburn if that’s what she eventually decided to do. While it was not easy to walk away from the paid grad assistantship, she chose to pursue her post-Auburn adventure and enter the job market. Once again, it was primarily her decision, and she knew she had our support. Now that the job hunt was on, Sarah was looking at all options that fit her interests. She considered offers for paid internships with private companies and also pursued positions with nonprofits in Nashville, which is where we thought she would wind up. Then she had a conversation with a former Friend of Aubie. Evan was a generous mentor and connector, and made some introductions for her through his own professional network, including one who worked at 2U. Things fell into place pretty quickly. Sarah believes that she clicked with 2U because of a shared sense of mission and purpose. She credits Auburn with providing the opportunities that helped her identify her interests and passions. These experiences focused and directed her job search. Beginning as a freshman, and through a combination of intentional decisions and serendipity, Sarah continually created options for herself. By following her passions and stepping out of her comfort zone, she created opportunities. She broadened her horizons and was able to see beyond her original plans. This led to smart changes to her course of study. She made great relationships that created a solid network, leading to opportunities as well as good counsel from those closest to her. She had to make some tough decisions, but they were the good kind of decisions where no option was a bad one. Her Auburn experience gave her the courage and confidence to believe in herself. Let your students learn an appreciation for the consequences (positive and negative) of their own decisions. Give candid feedback, but be willing to let go, unless of course, you see them heading for a cliff. This requires a good level of trust and communication. Encourage smart risks. Support decisions that are well-thought-out and values-based, and describe them as such when discussing them. Accept that very few decisions are entirely risk-free or guaranteed to produce a perfect outcome. Encourage your student to network and build connections. The best networkers are the ones who give more often than they seek. Taking advantage of Auburn’s extensive student involvement opportunities is a great way to build a network. Show your support by actively buying into the Auburn experience. Join the Auburn University Parents’ Association. Get to know your region’s AUPA Board member. Join your local AU Club and build your own network with other Auburn families. Make a point to meet your students’ peers and the campus officials and staff they work with most closely. There will be moments of self-doubt, feelings of being overwhelmed at times, peer pressures, and all kinds of other stressors on our students. While we tend to focus on the joyous times, these darker moments are still a part of the learning and growing experience. Help your student keep those things in perspective and maintain an even keel. And if your parental alarms start going off, there are so many campus resources just waiting to assist. Use them! Remain in the moment, because these years zip by! Here’s wishing you all the very best that Auburn has to offer to your students and your families. War Eagle! Chris Perez is an Auburn Dad from the Maryland suburbs of the Washington, DC, area. He is an alum of the Auburn University Parents’ Association. He was a two-year member of the AUPA Board of Directors and served as the board’s 2nd Vice President in his final year. Chris and his wife Jan are already planning an Auburn football weekend this fall. Spring is in the Air – Time to Prepare! Should your Student Study Abroad?